A short post describing my car selection experience. In today’s market, a consumer is spoiled for choice and buying a car can be a confusing and tiresome exercise. Recently, I was in the market for a new car and wanted to jot down the process that I went through to finalize my purchase. It is advisable to foresee your requirement of a car at least 3 months prior to purchase. The reason why this period is required, especially if you are a first-time buyer, is because once you come to the conclusion of buying a new car, you will be able to better observe yourself and judge your requirements, research prospective candidate cars better, plan your finances and most importantly, have room to negotiate for the best possible deal. 2. Make sure that the car you test drive is not having more than 5000 Kms. on its odometer. The more a test car has been driven, the less it will reflect the true potential of a new car of the same make and model. 3. Design your test drive in such a way that the path undertaken would include heavy and moderate traffic, include at least two red light junctures and at least one U-turn. The purpose of such a design is to test the acceleration of the car when starting from a stationary position at a red light, lane changing and handling capabilities, steering feedback and get a feel for the space required to turn the car around on a U-turn. Specifications are one thing but, driving dynamics of a car can only be felt when a car is actually driven. 4. Make sure that you are using the air conditioner (summer and/or winter) of the car at the setting of your choice and observe the blower noise levels. 5. If you like a quiet cabin, then observe the Noise-Vibration-Harshness (NVH) levels both when the car is idle and when being driven. Car at idle will give you an idea of the NVH levels introduced due to engine. Car while being driven, will give you an idea about the NVH levels due to engine, tires, head wind and cross wind. 6. Do play music while test driving the vehicle. It will give you an indication of the capabilities of the music system and the level to which it can suppress noise while the car is being driven. 7. Try to schedule test drives of different cars in your shortlist in a back-to-back fashion. That will project a better comparison of driving dynamics of different cars. 8. If you have an old car, never sell that car before buying the new one. If you are planning to exchange it in lieu of the new one, then handover your old car on the day of the delivery of the new one. Due to circumstances beyond anyone’s control, a car dealership may not deliver you your new car on the promised date and if you get rid of your old car before getting a new one, then you may suffer from limited mobility and increased travel expenditure and time investment. 9. When you talk with a dealership, express your interest to buy the car in a span of two-three weeks. This conveys to a dealer that you are serious about the purchase and they will try to give you the best possible deal. 10. There are three periods in any given calendar year, which are generally the best possible times to buy a car – the month of March which signifies the closing of the financial year, festive season of Dussehra and Diwali in India (will vary from country to country), and the month of December which signifies the closing of the calendar year. Car manufacturers give the best deals in these three periods. Car manufacturers in India generally increase prices of cars from January 1 of a new calendar year, so you may want to avail the discounts that are offered at the end of a calendar year. Start with your functional requirements whether you require a hatchback, an entry level sub-compact sedan, a full sedan, utility vehicle like an SUV, a van or a pick-up truck. Since car is something that is generally kept for a minimum period of 3-5 years, try to project your requirements, which may not exist at present. For example: You may not be having a whole lot of parking space available at the time of car purchase, which may tilt your decision towards buying a compact hatchback, but a year into the future, you may be planning to purchase a new home with a dedicated garage. In such circumstances, it is better to buy a compact sedan, than a small hatchback, which you may feel out of place or inadequate once you move in into your new home. Under this method of selecting a car, you can focus on the features that you must absolutely have and features that are nice to have. Please note that apart from the airbags and head restraints, all the aforementioned safety measures are active-preventive in nature i.e. they help you reduce the probability of a crash. Airbags, head restraints and the physical structure of a car are passive-preventive safety measures which help passengers survive a crash. It is always a better idea to get as many factory-fitted features as possible as you get to enjoy the manufacturer’s warranty on those items, as against to a non-existent or hard to obtain on after-market solutions. In a lot of cases, you can also avail extended warranty on a lot of features that come in factory-fitted condition. This selection methodology warrants minimum explanation. One advise that bears mention here is that it is always a good idea to keep a maximum figure in mind and then keep a 5% margin on top of the maximum figure. This will help in case the manufacturer raises the price of the vehicle or you end up selecting a variant with higher specifications. Also keep in mind that sometimes it is profitable to finance the car purchase, rather than pay up lump-sum from personal finances. This is pre-dominantly true in a vibrant economy where you can earn more money by investing and earning interest on your principal amount and take advantage of the low interest rates on car loans. However, it makes sense to buy a car with lump-sum money if you want to save the hassle of going through paper work required to take a car loan and once the loan is paid, to get the car transferred in your name. 1. They want to feel taken care of when they visit the service centre. They need the service advisor to listen to the problem(s) that are facing, accurately diagnose the problem and provide a quick and cheapest resolution. A customer wants to feel pampered, not necessarily with tea, muffins and croissants, but with a caring attitude from the service staff. 2. Fast turn-around time for service. Since the car a customer has given for service or repair may be the only car that he/she might be having, it is imperative, that he/she would want the vehicle as soon as possible. One thing to note here is that, even if the turn-around time cannot be measured in hours, even if it is a day or two, a customer would appreciate, if it is accurate and service is done with focus on quality. 3. Readily available spare parts is another factor that is critical in having a fulfilling experience in this dimension. Rely on the feedback provided by other customers in this area. Even the best of the car manufacturers can deliver a sub-par after-sales support experience. Keep in mind that at the end of the day, you will be dealing with human beings in the service centre and they may be having a bad day. Give them at least two separate chances to serve you, and then decide for yourselves. In case you get a consistently bad experience from a service centre, change the service centre. If you are the kind of person, who likes to change his/her car every few years (read 2-4 years), your decision may also get affected by the perceived resale value of the car in the market. Some cars, even though have everything better than their rivals, fetch poor resale value in the market owing to a negative perception. That perception may be due to lack of perceived reliability, cost of maintenance, lack of after-sales support service centres, or a combination of all the aforementioned factors. In such kind of circumstances, it is best to stay away from such a car and go with one which may be your second choice but would fetch your greater resale value. If you intend to keep the car for as long as possible, then you can overlook this factor. I hope this article gave you some insight in a succinct manner on what selection criterion you may use for your next car purchase. It is in no way exhaustive, but definitely will nudge you in the right direction. 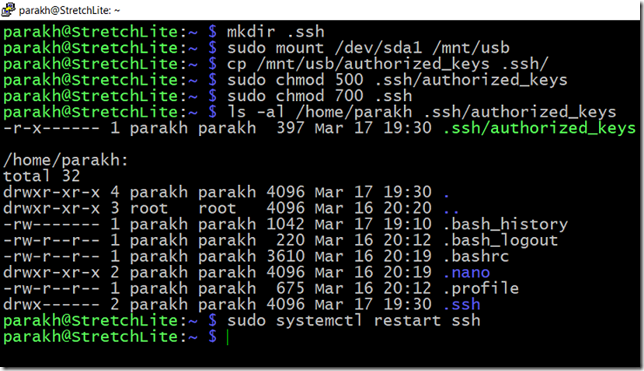 In this post, we learn how enable a passwordless SSH login to our Raspberry Pi. In any modern operating system when you login, you are greeted with a login screen asking for your credentials. If you are the only user using the system, you may be spared the labor of filling in the username, but a password still will be required to login. We can forgo the exercise of filling the password by virtue of asymmetric encryption. Asymmetric encryption makes two types of keys available – private and public. As the name suggests, public key can be made available to the public while the private key remain with the system which needs to do the authentication. In our case we will be logging into Raspberry Pi using SSH and will use key based authentication mechanism to login, forgoing the need of any password. Pi will send the public key over the wire to the host operating system running Putty which will then compare it with the companion private key. If a match is found, the user authenticates successfully. Note that the private keys never travels over the wire. Both the aforementioned software components come bundled with Putty, so if you have Putty installed, there’s a good chance that they are already installed on your system. 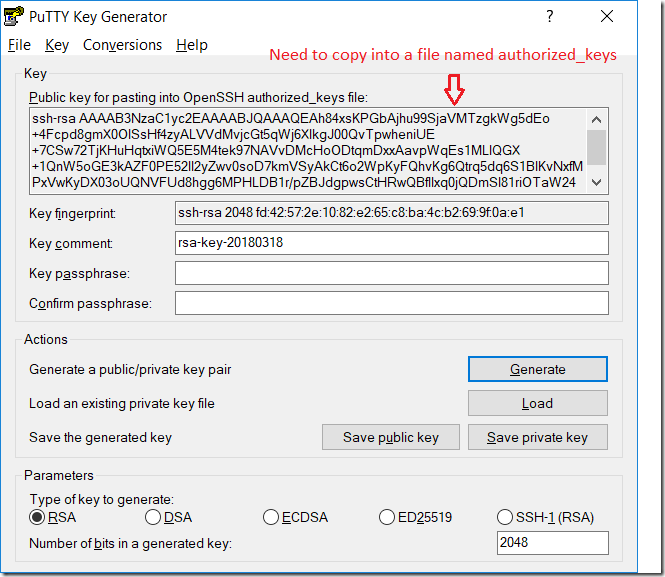 Open PuTTYgen and click on the “Generate” button generate a pair of keys. Make sure that “RSA” algorithm is selected with key strength of 2048 bits. 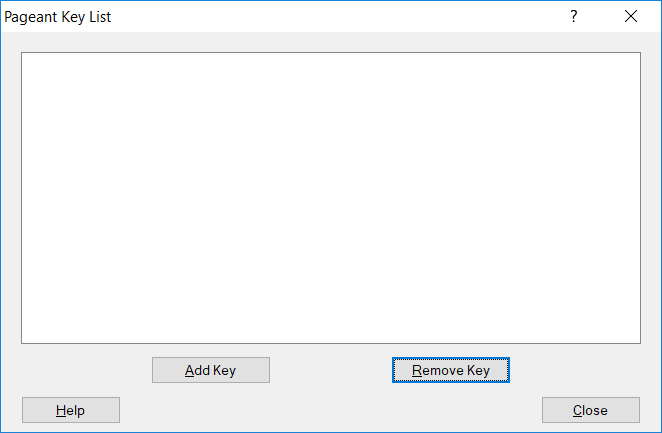 Once generated, use the in-built facility and save the public and private keys to the folder which you consider save enough to retain your private key for future reference. DO NOT SHARE YOUR PRIVATE KEY WITH ANYONE. Now, the most important part. If you look at the format of the public key saved by PuTTYgen, you will find that it spawns multiple lines. It is un-usable in majority of the systems and exists only for reference. 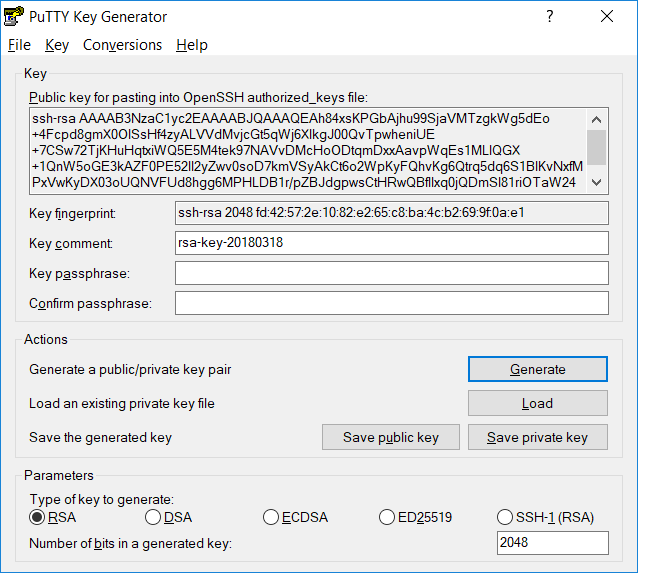 We need to copy the public key in the large “Key” window, which specifically makes the key properly formatted for use in OpenSSH based authentication systems. 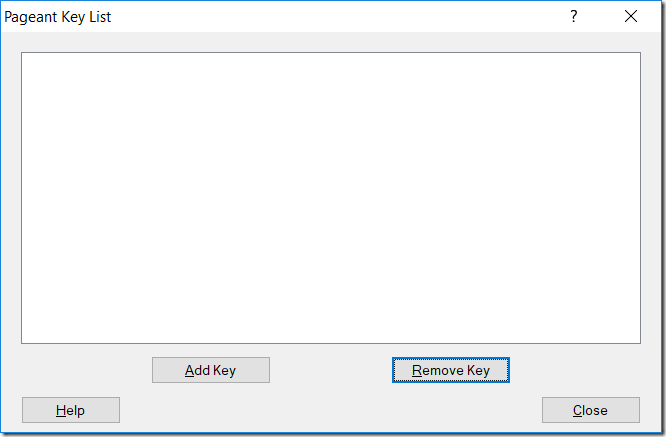 Copy the key into a simple text file and name it “authorized_keys” and remove the txt extension. 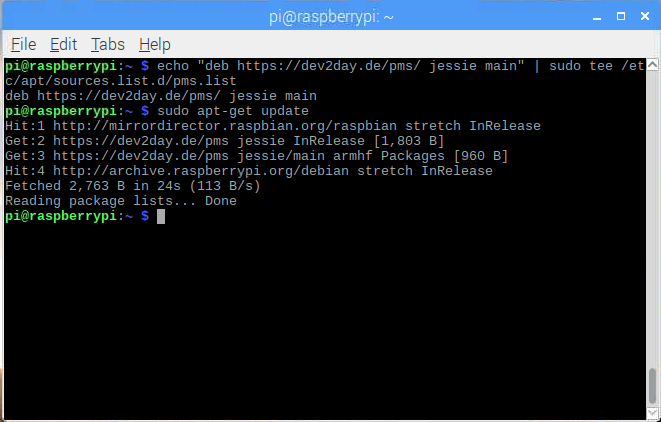 This is the file that will be used by Raspbian Stretch operating system without any further configuration. Now run the Pageant agent in your Windows system and add the private key generated previously. The private key should have an extension “ppk”. Pageant agent will run on the host operating system where from you want to connect and will keep the private key handy. 1. Create a .ssh folder (hidden folder) in the home directory of the user for whom you want to use key based authentication. 2. 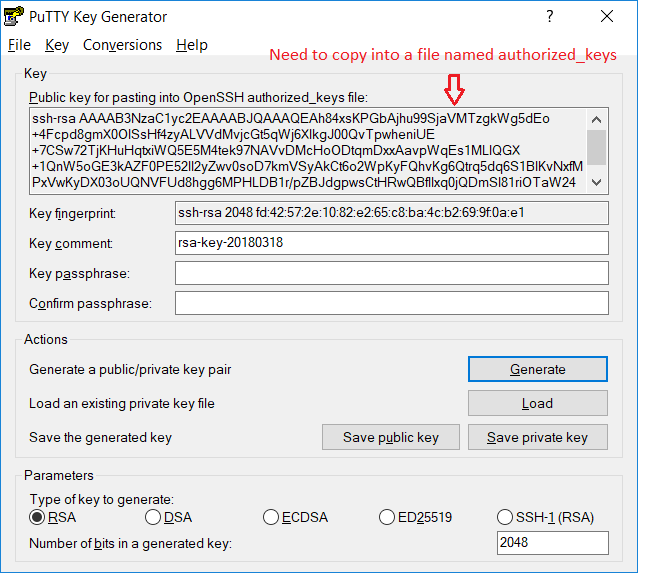 Copy over the public key (NOT PRIVATE KEY) that you generated previously and named “authentication_keys” to the folder. I used a thumb drive for the purpose. 3. Secure the key file and the .ssh folder. Only the user meant to use the key based authentication should be able to access the key file in read-only and executable capacity. 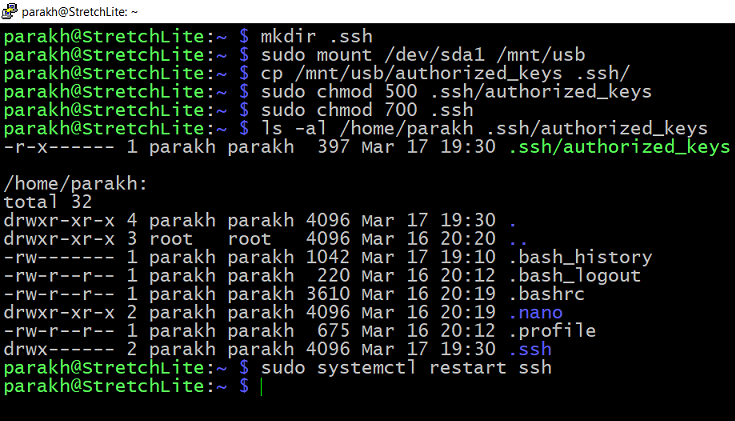 The .ssh folder should be off limits to everyone else. 4. 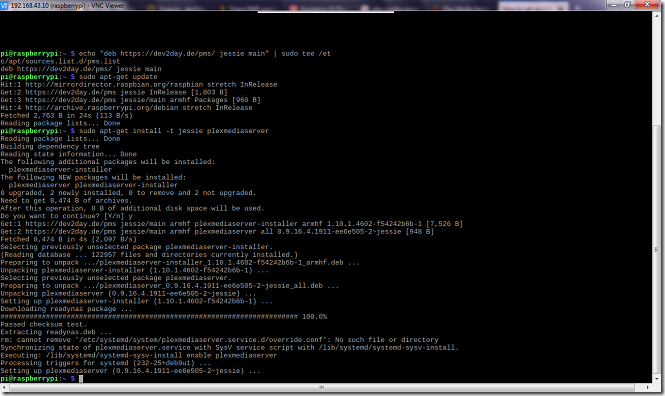 Restart the ssh service. 5. Logout and log back in with the username for which you enabled the key based authentication. All this was made possible by the magic of asymmetric encryption. The good thing about this scheme is that if, for some reason the public key on Raspberry Pi gets corrupted, or the Pageant is not running in the background on the host operating system, then you get offered the good-old password challenge. I purposely exited the Peagent and as expected Pi challenged me with a password corresponding to my account. 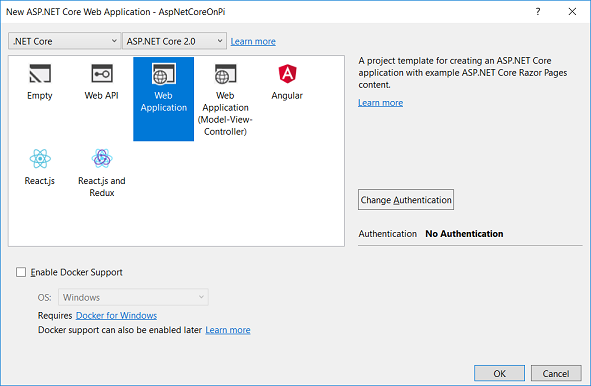 In this post I explore how to run ASP.Net Core web application on Raspbian Stretch operating system on Raspberry Pi 3 hardware. 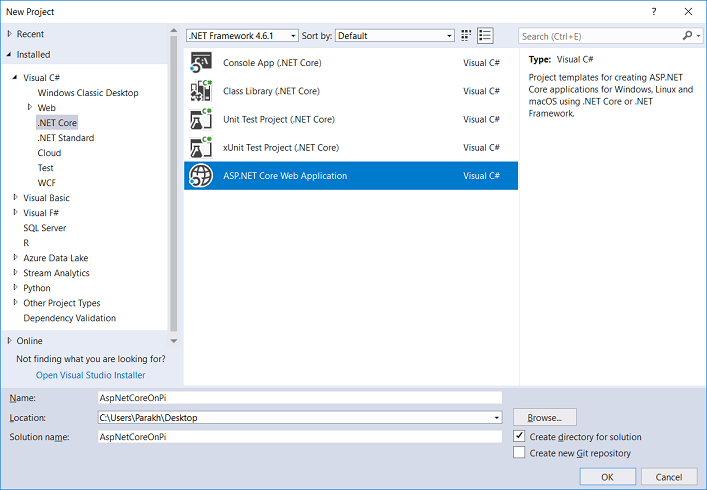 .Net Core allows for a cross platform operation of applications on supported hardware and software. This extends to ASP.Net Core. 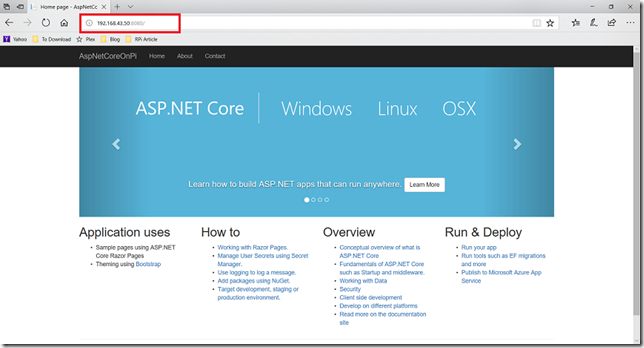 In this post I am going to show how to run ASP.Net Core in self-contained deployment mode on Raspberry Pi 3. 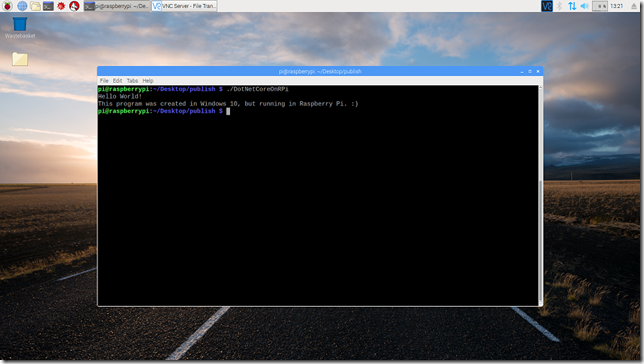 In my last post I showed how to run a .Net Core console application in Raspberry Pi. 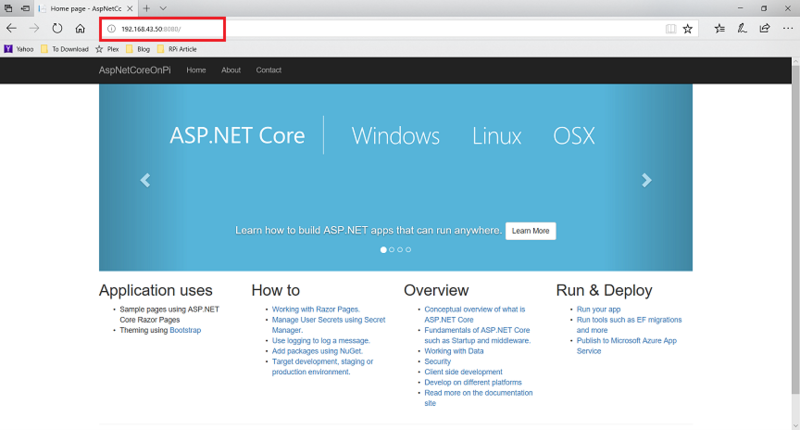 In this post I am going to show how to run an ASP.Net Core Web application on Raspbian Stretch operating system using Raspberry Pi 3 hardware. Before you do that make sure that you have assigned a static IP address to Pi. You can learn how to do that in one of my previous post. 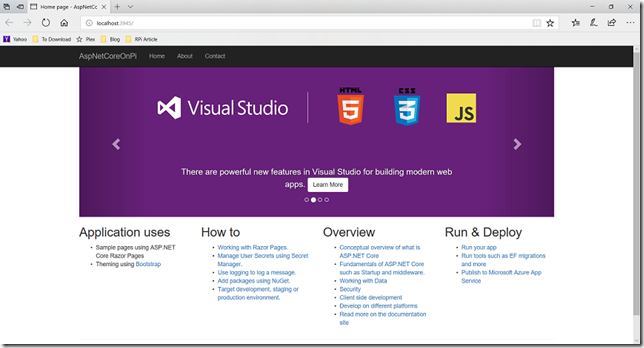 First create a new ASP.Net Core Web application project in Visual Studio which does not rely on any kind of authentication. 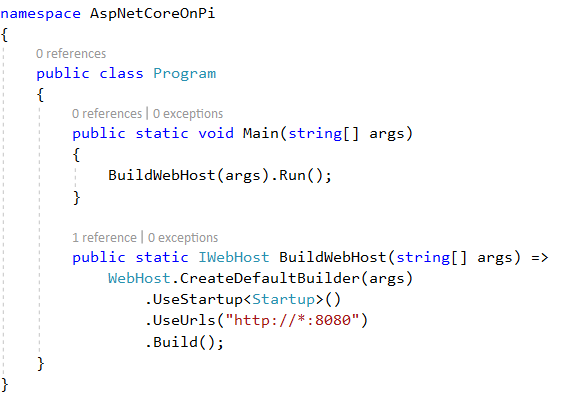 Since the aim of this post is learn how to run an ASP.Net Core application on Pi, let’s keep things simple. We will not do any modification to any of the pages in the application. Build and run the application locally to make sure that it works. The application is running locally using IIS Express and listening at the address mentioned in launchSettings.json file under Properties in the project hierarchy. When it comes to hosting the application in Pi, we need to makes sure that the application listens at the desired IP address and port. This is accomplished using the “UseUrls” method in Program.cs file. The “UseUrls” method specifies the URL scheme that the web host will use to listen to the incoming requests. Since we will be using the Kestrel web server via terminal in Pi, it is important that we change the port in the Program.cs file, as shown in the image. 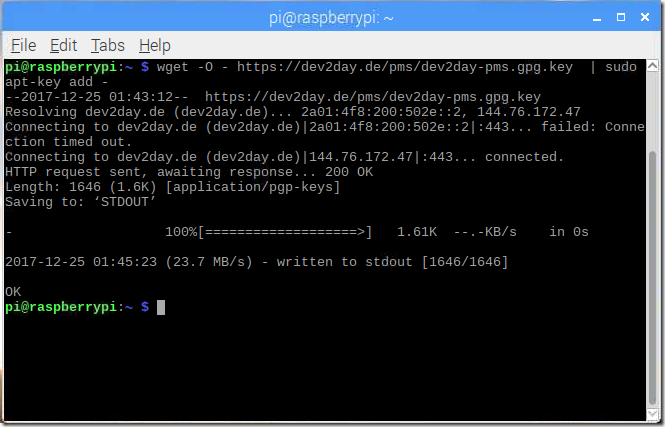 Make sure that the port that you assign is not in use by some other app in Pi. Now copy the entire publish directory to Pi. This will give us not only our application, but also the server infrastructure to serve the application. Make sure that you have the appropriate permission to run not only the application, but also the Kestrel server under your account. You can use the following command to recursively allow your account have the execute permission on all the assemblies inside the publish folder. 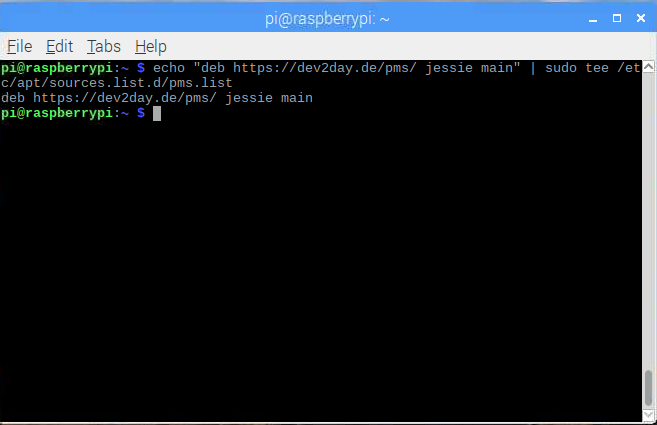 Now hop into your browser in your computer and use the IP address of your Pi in conjunction of the port on which the Kestrel server is listening. 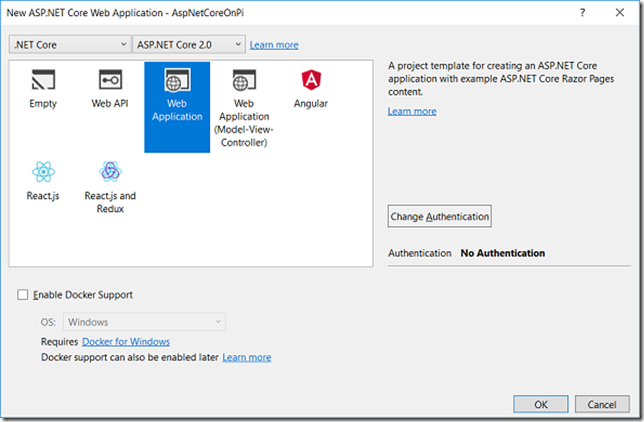 In this blog post we create a .net core based console application and run it on Raspberry Pi 3. Raspberry Pi is an experimenter’s dream come true. It offers light to medium computing power in a small form factor with all the bells and whistles like Wi-Fi, Ethernet, Bluetooth, USB 2.0 ports etc. Further augmenting a tinkerer’s abilities are the software capabilities, which now stand further extended due to the introduction of .Net Core which allow you to leverage your existing background with Visual C# and run code on ARM architecture. 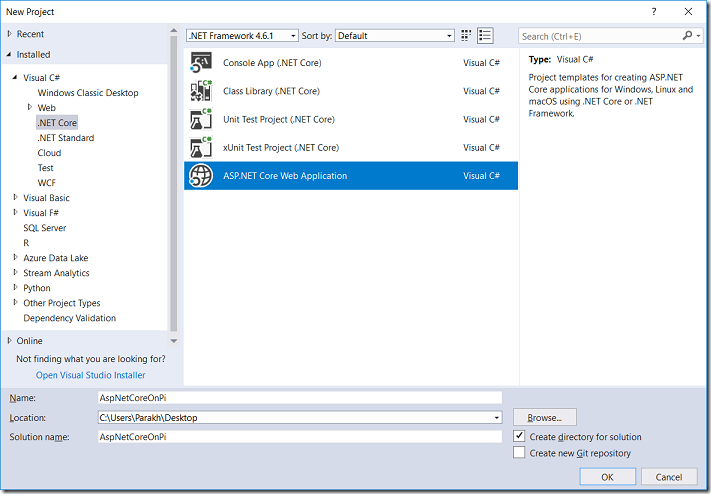 In this post we will take a look at all the steps that one has to perform to run code created using Visual C# and targeting .Net Core on a Raspberry Pi 3. 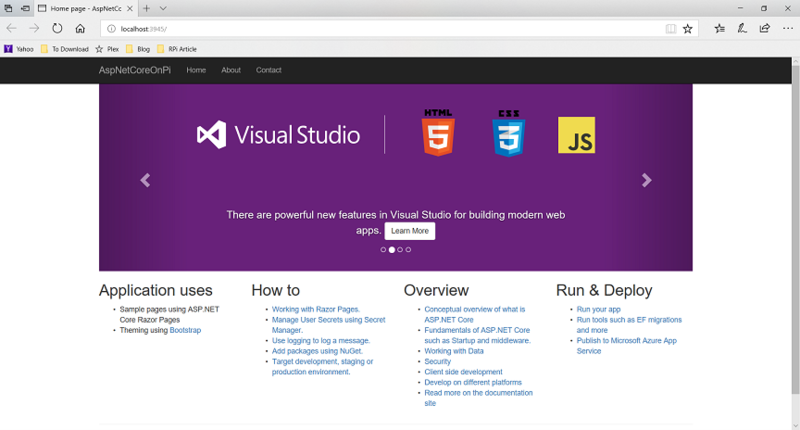 .Net Core is a cross platform offering from Microsoft which allows you to run your C# code on multiple hardware (x86, x64, ARM etc.) and software platforms (Windows, Linux and macOS). Of course, it does not provide universal coverage, and at the time of writing this post, industrial grade long-term support versions of operating systems are being targeted with higher priority by Microsoft. It is natural, after all those are the operating systems that organizations would be using to run their applications. 1. Note that the compilation targeting ARM hardware (ARM32) for both Linux and Windows software platforms are not being officially supported by Microsoft. So, have justified expectations and be prepared to get your hands dirty with some virtual dirt. See their official statement here. 2. 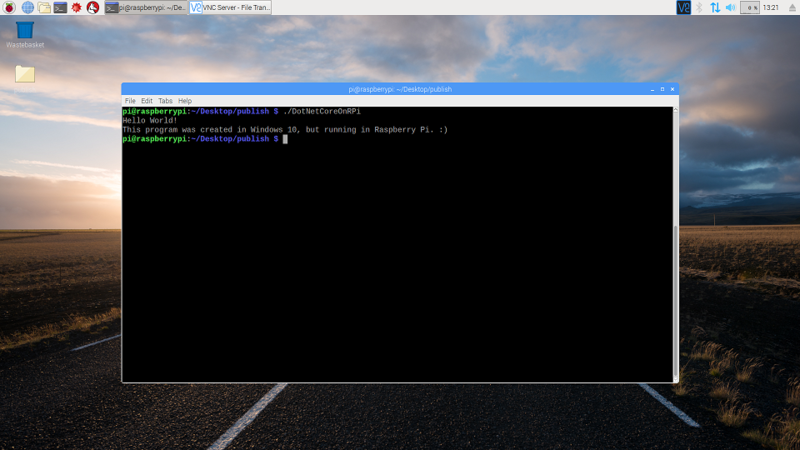 At the time of writing this post, it is only possible to run .Net Core code on Raspberry Pi 2 and 3, and not on Pi Zero. This is because .Net Core at the moment targets ARMv7 instruction set and above for ARM architectures. Raspberry Pi 3 uses a Broadcom BCM2837 chip which uses ARMv8 instruction set, while Raspberry Pi Zero uses BCM2835 chip which uses ARMv6 instruction set. See the official statement here. 3. There is no Software Development Kit (SDK) available at the moment that helps you develop software on Raspberry Pi for Raspberry Pi, so you will have to develop your code on a supported development environment and then copy over to Pi for execution. Alright, if you have made this far, I am assuming that you want to give it a go. Save your program and open the developer console and navigate to the folder containing your project. Any application targeting .Net Core can be executed either as a self-contained application (Self-contained deployment) packing all the assemblies that its execution depends upon, or as an application depending on the .Net Core framework (Framework-dependent deployment). You can read more about that here. 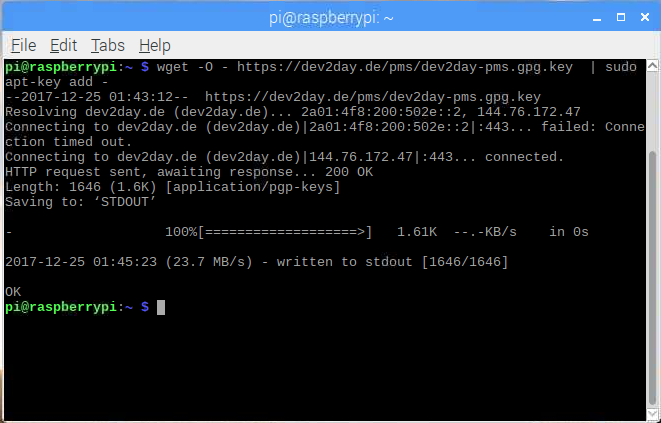 We will publish our application as a self-contained application on Raspberry Pi. In order for the application to execute in a supported operating system, it still needs some functionality that is supported by the targeted operating system. 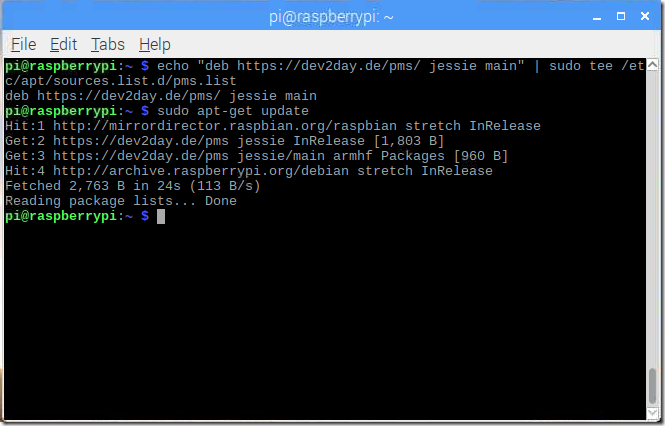 Raspbian Stretch operating system, the official operating system supported by the Raspberry Pi Foundation, comes missing just one essential package. Run the following code to install the “libunwind” package. This will create a folder in the bin/Debug/netcoreapp2.0 named “linux-arm”. Within the linux-arm folder will be a folder named “publish”. For now, all the official and un-official documentation points to the fact that framework-dependent deployments are not supported. Let’s hope that Microsoft starts supporting Arm32 builds officially and we can reduce the size of our deployments by relying on the .net core framework available on a system-wide basis. In this post we see how to install Plex Media Server on Raspberry Pi 3. 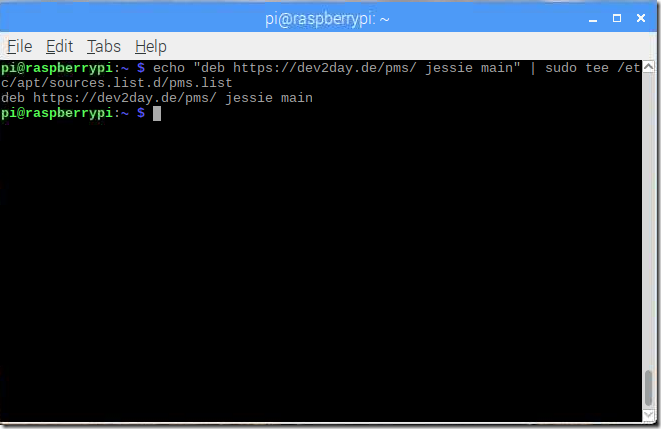 In my last post I wrote about how to install and operate Raspbian operating system in a headless mode using a static IP address with the intention of starting and using services that require a static IP address. Plex Media Server is one such service which can run fruitfully on Raspberry Pi 3 Model B and use the hardware to the fullest. 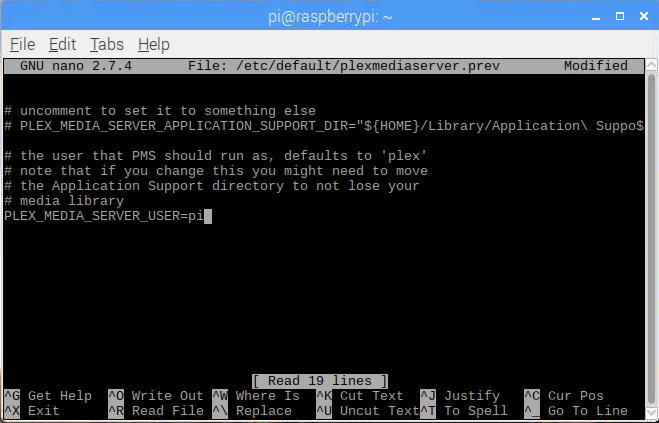 In this post I will demonstrate how to install Plex Media Server on your Raspberry Pi and consume media from it. Plex Media Server as the name suggests is a media server and can serve various types of media on a variety of devices. The basic premise behind the server is to provide media to the consuming point per the capabilities of the client. For example, if you have a video file in mkv (Matroska) format and you want to see the video on an iPad, you cannot do until you transcode the file into a format that is compatible with iPad. In this case it will be mp4. Plex provides on the fly transcoding capabilities, so you do not have to wait for the entire video file to be transcoded and then see it. It instead, transcodes the file on the fly and streams it to your device. Update command brings information about the newer versions of the packages installed in the operating system and are available in the repository, while upgrade actually downloads the packages and installs them. Please note that upgrading the packages can download a significant amount of data, so if you are on metered bandwidth, beware. Once Pi comes up, go to the static IP address at which Pi operates appended by “:32400/web” and it will take you to the welcome screen. From there on you can register for an account and add media to your library. 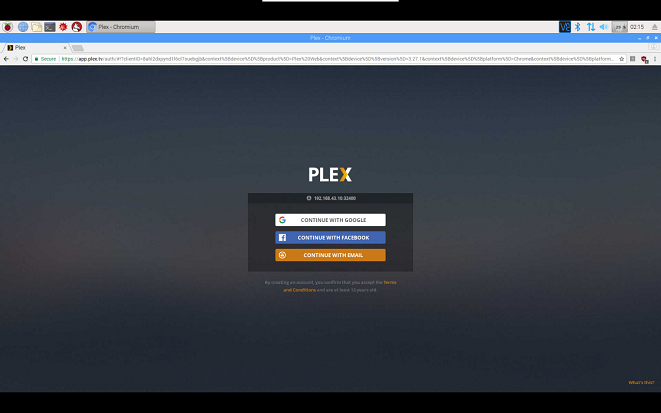 Note that creating and using an account is not necessary to use Plex. 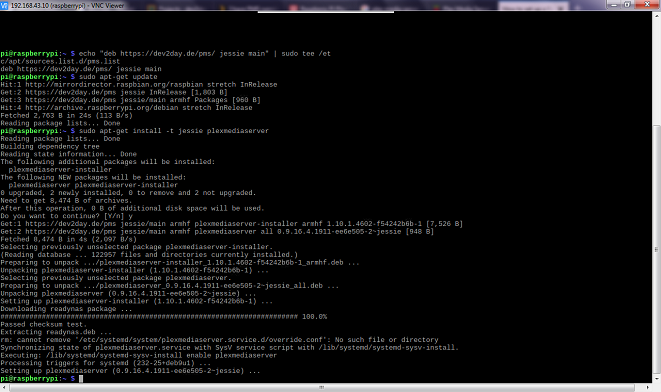 Welcome to Plex Media Server on Raspberry Pi.